Clear skies have allowed temperatures to cool down this morning, and more importantly they’ve afforded most of the region a good view of the total lunar eclipse. The Earth passed between the Sun and Moon just as the Moon set, and Sun rose over southeast Texas on Wednesday morning. Southerly winds have returned to Houston, and this will allow temperatures to climb today to about 70 degrees under partly to mostly sunny skies. All in all, it should be a fairly pleasant day for the region, with temperatures tonight 10 to 15 degrees warmer than Tuesday night. Thursday will be even warmer, with highs in the mid-70s as southerly winds draw in warmth to the region. Some scattered, light showers are possible during the afternoon, evening, and overnight hours as a cool front approaches the area, and moves through. It should be off the coast before sunrise on Friday. A much cooler day, with mostly cloudy skies and highs generally in the upper 50s. Winds will be out of the north, but I don’t think they’ll be too gusty like they are after some cold fronts we get. Lows Friday night should fall into the 40s for most of the region. Houston is seeing temperatures this morning that range from the mid-30s inland to the upper 40s along the coast. This will probably be the region’s coldest night for about a week or so, and at this point another freeze seems unlikely for the next 10 days. The region will see quintessential winter weather, with highs of around 60 degrees under full sunshine. 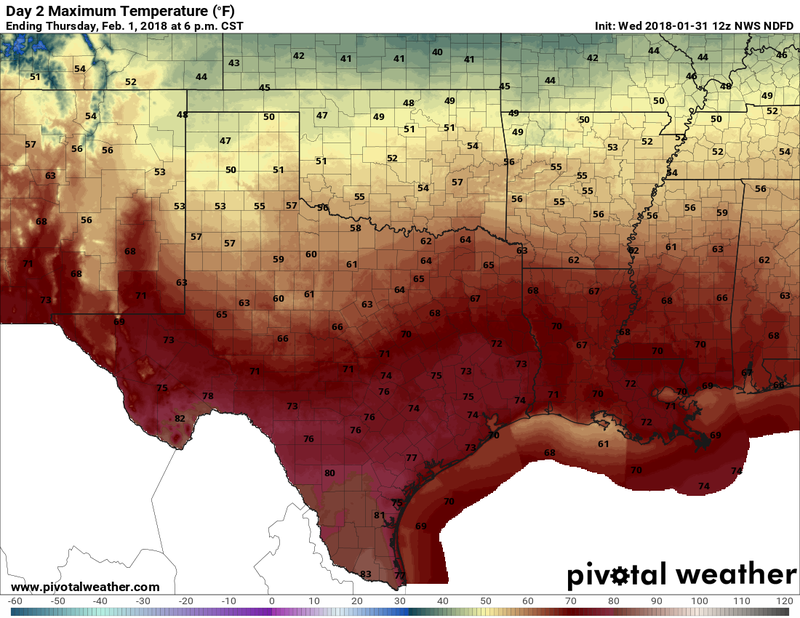 Lows Tuesday night and Wednesday morning will probably be about 5 degrees warmer than Tuesday morning and, importantly, skies should be mostly clear. Clear skies are important because of the opportunity to see a total lunar eclipse shortly before the Moon sets. For Houston, the totality begins at 6:51 am but the partial eclipse begins about an hour before that, so plan to get up a little early tomorrow to see a neat celestial sight. You’ll want a jacket. Southerly winds will return sometime on Tuesday, and that will allow for the return of scattered clouds on Wednesday, and nudge temperatures into the upper 60s. We should also see a much more mild night, with lows only in the 50s across the area. 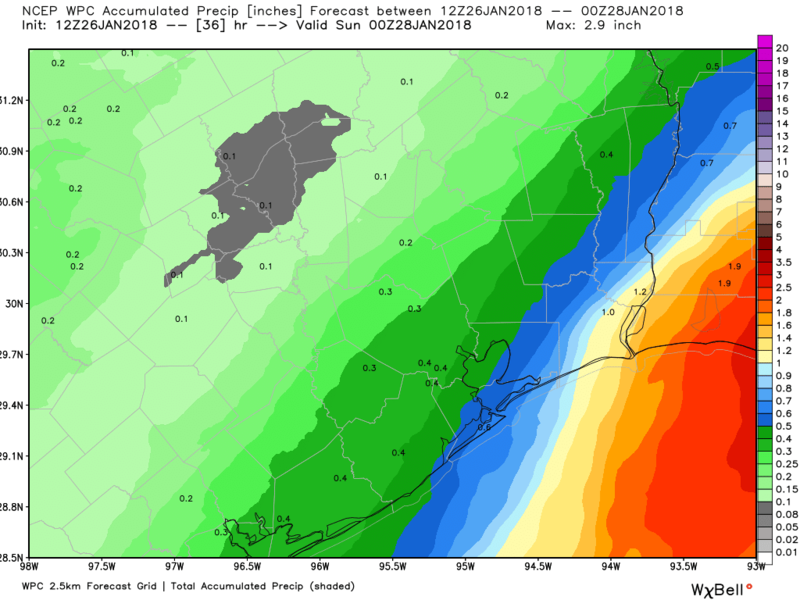 Houston had less than an ideal weekend, with storms Friday night and into Saturday morning, a gray day Saturday, and with skies only beginning to clear on Sunday afternoon. I’m sorry to say that next weekend doesn’t look ideal for outdoor activities either—although I wouldn’t bet on a total washout just yet. It’s chilly out this morning, with lows ranging from the upper 30s up north to around 50 degrees right along the coast. A reinforcing cold front will move into Houston today, likely before noon, and along with this we’ll see noticeably stronger northerly winds. This will bring drier, cooler air into the region. Expect highs in the mid-60s and sunny skies, with overnight lows tonight in the upper 30s to lower 40s for most of the Houston region. 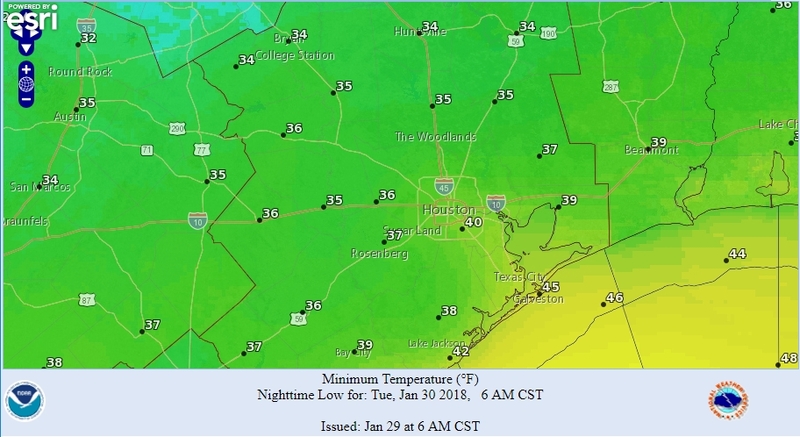 A freeze is possible for far northern Houston. A cool winter day with a high only of about 60 degrees under sunny skies. Overnight lows Tuesday night will be a few degrees warmer than Monday as winds shift from the northeast to the southeast. A pretty nice day. Moisture levels begin to return, but we’ll still see mostly sunny skies, and highs should climb to about 70 degrees for most of the area.